Survival of the fittest with cough and colds this time of year. Enter to win a survival pack from Scotties. Giveaway runs through 3/31 and is open to US residents only. Be prepared. By taking a look outside I can assure you that springtime is finally here! Does anyone else feel like winter was way longer than usual this year? Spring is my favorite season, but my allergies would disagree with me. While I love looking at all the flowers in bloom and the animals start popping up again, my nose runs and itches and I always have to make sure I have a pack of Scotties tissues around when I feel a sneeze coming on. 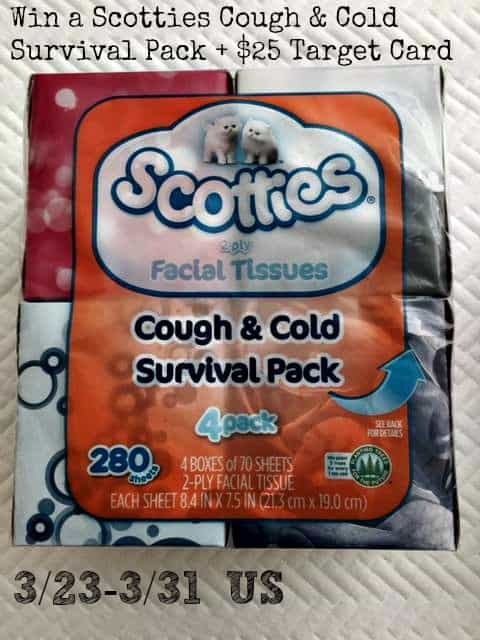 With that in mind I wanted to bring you a brand new giveaway featuring Scotties Tissues! We always use tissue during cold season...so much better. I love to be able to just throw the germs away. Then if it's soft like scotties that's a plus! I don't even have handkerchiefs! I would have to say I always use tissue! We do tissues because I do not like the idea of carrying the germs all around with a handkerchief. I always use tissues. They take the germs and put them in the garbage where they belong. Thanks I use tissues ;) you guys rock! I use lots and lots of tissues during the cold and cough season. Tissues. It seems like we went through about 20 boxes of tissues this winter. I am a tissue girl. I use both, tissues at home and hankerchiefs when I am out. Yes, we use tissues! Can't imagine not! Thanks for the chance! I use a ton of "soft" tissues! We use tissues. With the amount of times one of us has to blow our nose, I couldn't wash and dry handkerchiefs fast enough. I always use tissue paper when I have a cold. We really go through the Kleenex when we have a cold.